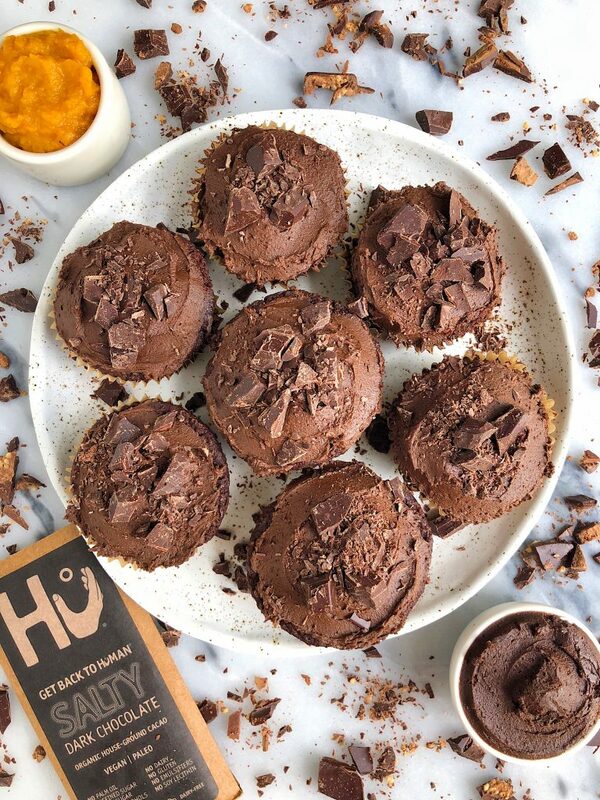 Healthy Gooey Double Chocolate Pumpkin Cupcakes made with all vegan and paleo ingredients for an easy homemade cupcake recipe filled with dark chocolate! 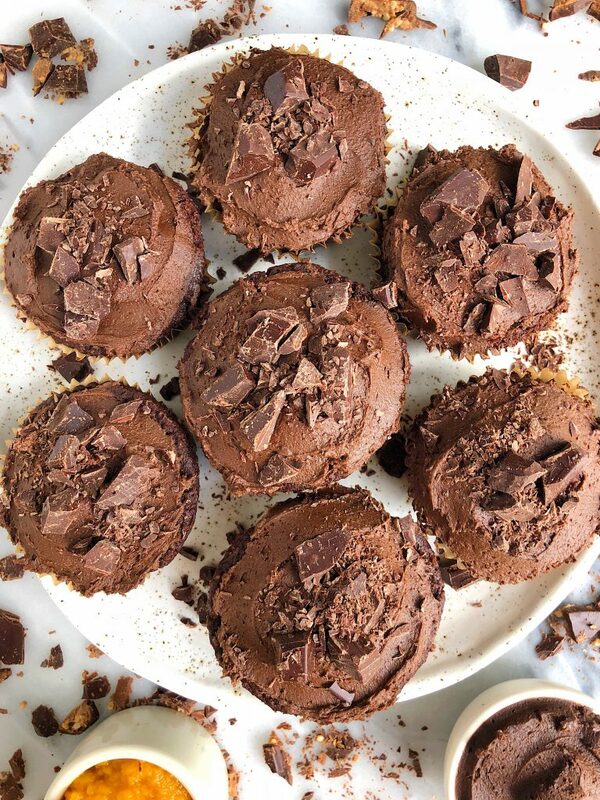 This recipe has me wondering why I haven’t been baking my own homemade cupcakes for forever. 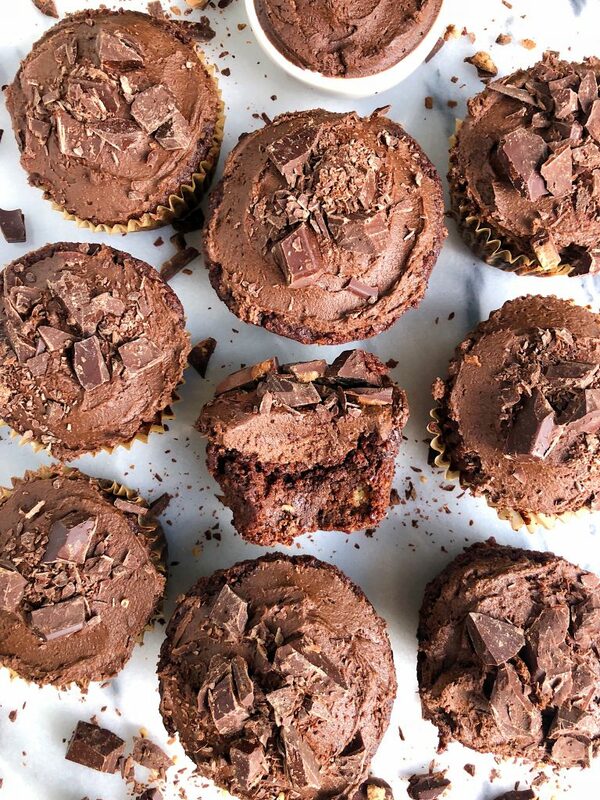 These Healthy Gooey Double Chocolate PUMPKIN Cupcakes are absolutely insane. They’re so chocolatey and rich and to be honest, you don’t even taste the pumpkin. It is really there for consistency and the texture it adds to the cupcakes. If you’re craving something a bit more “fall” and pumpkin spice, feel free to add in your favorite pumpkin spice blend. It will taste amazing too. These cupcakes though. They’re paleo, vegan and free of any refined sugar. It isn’t too common in the baking world to have a recipe that is both vegan and paleo and actually tastes good. From my past experience, it has been dry or the texture was off but today these cupcakes are going to prove to us that paleo and vegan baked goods can taste flipping GOOD. I love that this recipe is made with all simple and easy ingredients. Many of the usual suspects around here like flax egg, liquid coconut oil, almond flour and my beloved, Hu Kitchen Dark Chocolate. Baking with Hu’s chocolate has taken my baking up a few notches. They create the most epic flavored dark chocolate bars like Cashew Butter & Vanilla Bean, Hazelnut Butter and more. I use some of their dark chocolate and melt it to add into the batter. That is what gives this recipe the extra rich chocolate factor. I also use a pinch of their organic coffee in this recipe too! Don’t forget to share these with me on Instagram if you make them! And if you’re craving some more Hu goodness, check out these recipes: Paleo Chocolate Sheet Cake and Paleo Brownie Bread. Store in airtight container for 5 days on counter or freeze for a couple months. *If using pasture-raised eggs, you may need a bit more almond flour if the batter looks too liquidy! Could you please link that delicious looking frosting recipe?! it is linked in recipe already! Is it possible to omit the coffee? I’m not a huge coffee lover and therefore don’t have any around the house. These look amazing! Do I need to use coconut flour if I use spelt flour in place of almond flour? (Just asked the same question on Instagram). Thanks! They look great and I’m anxious to make them. Can I use vegetable oil in place of coconut oil?